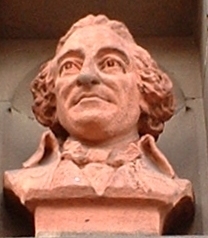 Tom Paine features as one of the five busts adorning the facade of the Secular Hall - Why? On the advice of Benjamin Franklin, Paine emigrated to America in 1774, where his book Common Sense (1776), and other writings arguing for republican government and independence were influential in the American revolution. Congress and the State of New York recognized his services by a grant of land.